Two recently published articles explore the attributes of successful CEOs and this post compares and contrasts the findings from both studies. The first study by McKinsey examined the top 5% of CEOs whose companies’ returns to shareholders had increased by more than 500% during their tenure. The sample of 120 exceptional CEOs were the highest performers in McKinsey’s data set of approximately 600 chief executives at S&P 500 companies between 2004 and 2014. In the second study, published in the May/June 2017 Harvard Business Review, ghSMART partnered with economists at the University of Chicago and Copenhagen Business School along with analysts at SAS and NYU (a team of 14 researchers in total) to mine ghSMART’s CEO Genome Project database, consisting of 17,000 C-suite executive assessments. Each executive assessment included detailed career and educational histories; performance appraisals; and information on patterns of behavior, decisions, and business results. The researchers examined the profiles of 930 CEOs and gathered information (financial results and board member & investor opinions) on the performance of 212 executives. Interviews were conducted with 70 CEOs and board members. 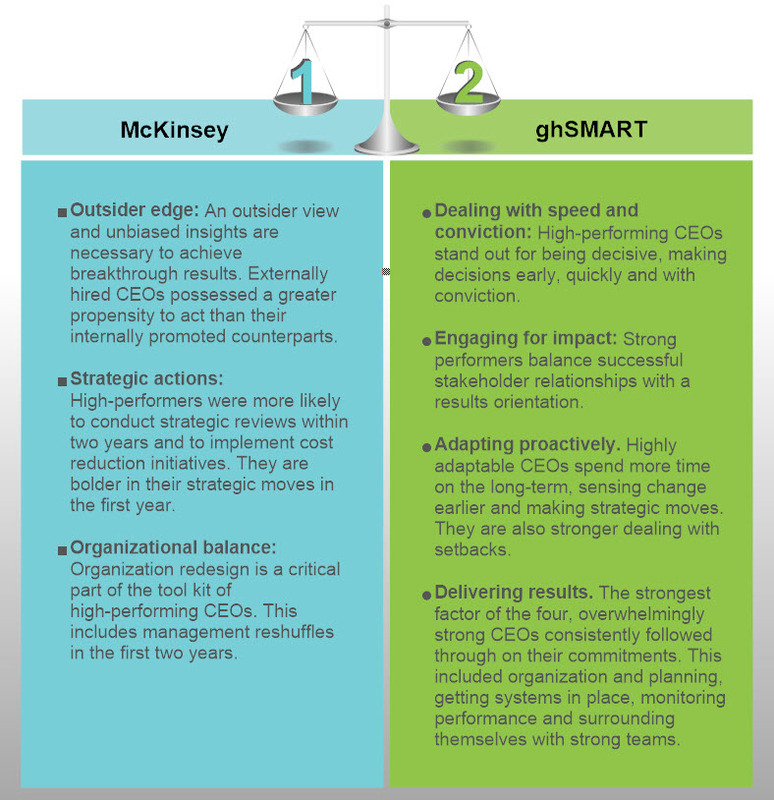 The following chart summarizes the findings of the two studies, which reveals some important similarities in the behaviors of top performing CEOs, such as focusing on strategy (conducting strategic reviews/making strategic moves); acting boldly and with conviction; and surrounding themselves with strong teams. One important distinction in the results of both studies is McKinsey’s finding that exceptional CEOs are twice as likely to have been hired from outside the company. Hiring outsiders, however, is a less common practice today. According to the Conference Board’s CEO Succession Practices, 2017 edition, 85.7% of incoming CEOs in 2016 were “insiders” who were promoted to the CEO position after serving at least one year with the company while 14.3% were “outsiders” with less than one year with the company. Their findings show a steady decrease in the appointment of outsiders, down from 20.4% in 2014 and 23.8% in 2013. Links to both studies are shown below, along with ghSMART’s CEO Genome Project™ website where you can learn more about one of these studies. 2016 CEO Success Study. Strategy&’s CEO Success study annually highlights the incoming class of CEOs at the world’s largest 2,500 public companies. CEO Genome. The CEO Genome Project™ is a center of excellence on how to become and succeed as a CEO. Take the short assessment to see how you measure up against the 4 essential behaviors that are associated with becoming a high performing CEO. CEO Succession Practices: 2017 Edition. Conference Board. CEO Succession Practices: 2017 This study analyzes all CEO succession events at S&P 500 companies over the last 16 years, with additional analysis based on our 2017 survey. Among the findings: CEO departures from underperforming companies reach a high not seen in 15 years. What Sets Successful CEOs Apart? by Elena Lytkina Botelho, Kim Rosenkoetter Powell, Stephen Kincaid and Dina Wang. Harvard Business Review. May/June 2017.